Whenever food has smoked or grilled flavour, there is no second thought about it. Because it has to be tasty. There are so many colorful vegetables available in grocery market during winter. I told you before that my love for winter is only because of food. We can make and also consume without any tension various types of food. Today I am talking about 'eggplant'. Though we both are not big fan of eggplant, but love it in 2/3 forms- 'begun vaja', 'begun pora' and 'begun vorta'. Yess, the recipe is about the last one. 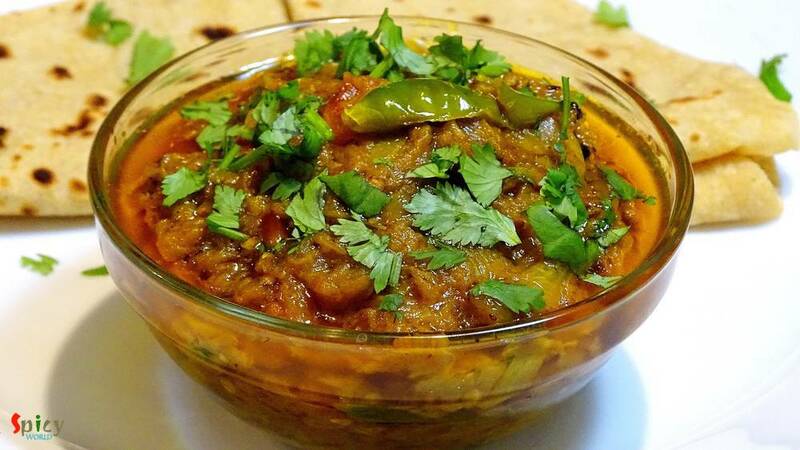 'Baingan bharta' is a very popular dhaba food in India. 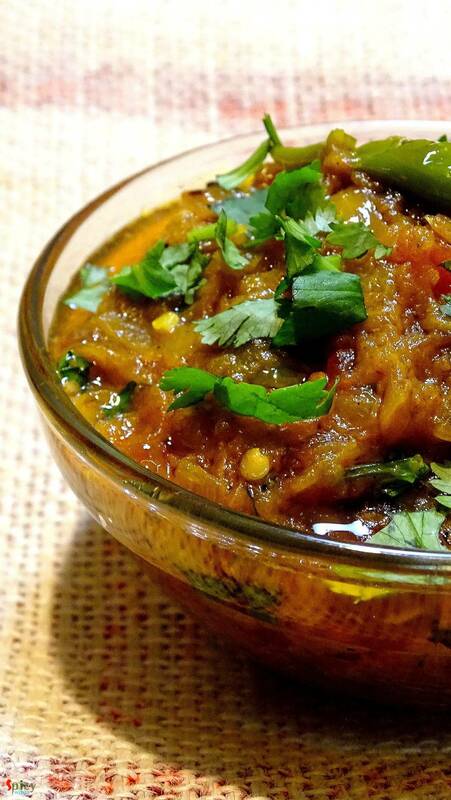 A simple veggie with loads of flavour will make your dinner a special one. 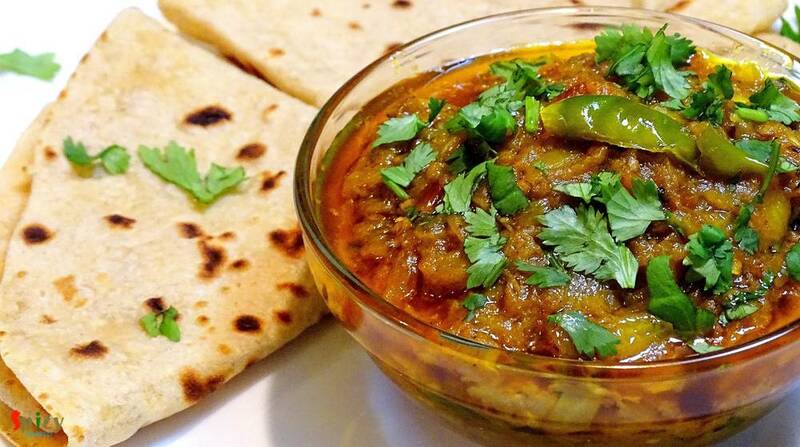 If you can make this bharta properly, the taste will beat any nonveg dish. Just close your eyes and give it a try. 3 Tablespoons of chopped tomato. 1 Teaspoon of cumin seeds and crushed coriander seeds. Spice powder (1 Teaspoon turmeric powder, 1 Teaspoon red chilli powder, 1 Teaspoon coriander powder and 1 Teaspoon garam masala). Some chopped coriander leaves / cilantro. 3-4 Tablespoons of mustard oil. Wash the eggplant and pat it dry. Trun on the burner and place the eggplant directly. Turn it around in every 2 minutes. Within 6-7 minutes the eggplant will become soft. Turn off the flame and put the smoked eggplant in a bowl of water for 15 minutes. After resting for 15 minutes in water, you can easily peel it's skin. After that mash it with your hand a bit. Add cumin and crushed coriander seeds in hot oil. Saute them for 30 seconds. Add chopped onion. Fry it till golden in color. Add ginger and garlic paste, salt, pinch of sugar and all the above mentioned spice powder. Mix everything well for 3-4 minutes. Then add chopped tomatoes and green chilies. Cook it for 5 minutes. Now its time to add mashed eggplant into the masala. Mix it very well for 15 minutes in slow flame. The more you cook, the more taste will come out. Add very little warm water, if you want. Cook it for another 10 minutes. Let it rest for 3 minutes, then serve.